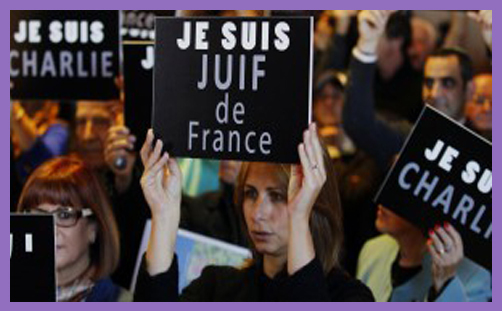 The choice was made by the French Revolution in 1789 to recognize Jews as full citizens. To understand what the idea of the Republic is about, you have to understand the central role played by the emancipation of the Jews. It is a founding principle. ..If 100,000 French people of Spanish origin were to leave, I would never say that France is not France anymore. But if 100,000 Jews leave, France will no longer be France. The French Republic will be judged a failure. ..Jews were sometimes marginalized in France, but this was not Spain or other countries – they were never expelled, and they play a role in the life of France that is central. ..There is a new anti-Semitism in France. We have the old anti-Semitism, and I’m obviously not downplaying it, that comes from the extreme right, but this new anti-Semitism comes from the difficult neighborhoods, from immigrants from the Middle East and North Africa, who have turned anger about Gaza into something very dangerous. Israel and Palestine are just a pretext. There is something far more profound taking place now. ..It is legitimate to criticize the politics of Israel. This criticism exists in Israel itself. But this is not what we are talking about in France. This is radical criticism of the very existence of Israel, which is anti-Semitic. There is an incontestable link between anti-Zionism and anti-Semitism. Behind anti-Zionism is anti-Semitism. ..The Jews of France are profoundly attached to France but they need reassurance that they are welcome here, that they are secure here. The suffering of Palestinians is caused not by Israel, but devised and formed by “Jewish hands”. Willcox didn’t say those hands offend and must be cut off, but he might as well have. When Jews are victimised, their businesses raided, their synagogues bombed and their cemeteries desecrated – and journalists and politicians justify this by objecting to ‘offensive’ cartoons and pointing to the plight of Palestinians – it is no wonder that Jews are leaving Europe for a safer home. A survey published in November 2013 by the Fundamental Rights Agency of the European Union observed that Jews across Europe “face insults, discrimination and physical violence, which despite concerted efforts by both the EU and its member states, shows no signs of fading into the past”. Two-thirds considered anti-Semitism to be a problem across the countries surveyed. Overall, 76% of respondents said that anti-Semitism had worsened over the past five years. Throughout Europe, the historical stain of anti-Semitism continued to be a fact of life on Internet fora, in soccer stadiums, and through Nazi-like salutes, leading many individuals who are Jewish to conceal their religious identity. ..Rising anti-Semitism and anti-Muslim sentiment in parts of Europe demonstrated that intolerance is not limited to countries in active conflict. The European Union’s Fundamental Rights Agency (FRA) survey of perceptions of anti-Semitism among Jews in eight member states (Belgium, France, Germany, Hungary, Italy, Latvia, Sweden and United Kingdom), released in November, found that in some countries as many as 48 percent of the local Jewish population had considered emigrating because of anti-Semitism. Jews are being advised not to go out onto the streets wearing a kippah. In Toulouse, Jewish children are shot in a Jewish school. In Brussels, people are randomly killed in a Jewish museum: if they happen to be Jews or Israelis, all the better. In Liege, a café displayed a sign in its window which said dogs were welcome, but Jews were not allowed to enter. This is Christian Europe, which, of all the continents of the world, ought to feel the deepest shame at the rise of this “new anti-Semitism”. And the oppressors are not all hardened Islamists obligingly plotting their next spectacular on SnapChat and WhatsApp for the convenience of MI5: no, many are simply ordinary but angry, young, male Muslims, itching for some self-proclaimed imam to issue the Call to Jihad. The Jews are leaving Europe not because the Jihadists are coming, but because they are already here, dwelling among us. They hate Israel and they loathe Jews, but, pace Manuel Valls, we say almost nothing and do very little. Instead, we let the Jews emigrate to the United States or “go back” to Israel, and they are doing so in their thousands every year. In the Holy Land they may be surrounded on all sides by the enemies of Zionism, but at least they have in Benjamin Netanyahu the leader of a government which will not hesitate to shelter and defend them. It will even bury their martyred bodies in fortified Jewish cemeteries in Jerusalem, where their sanctified graves will never be defiled with swastikas.